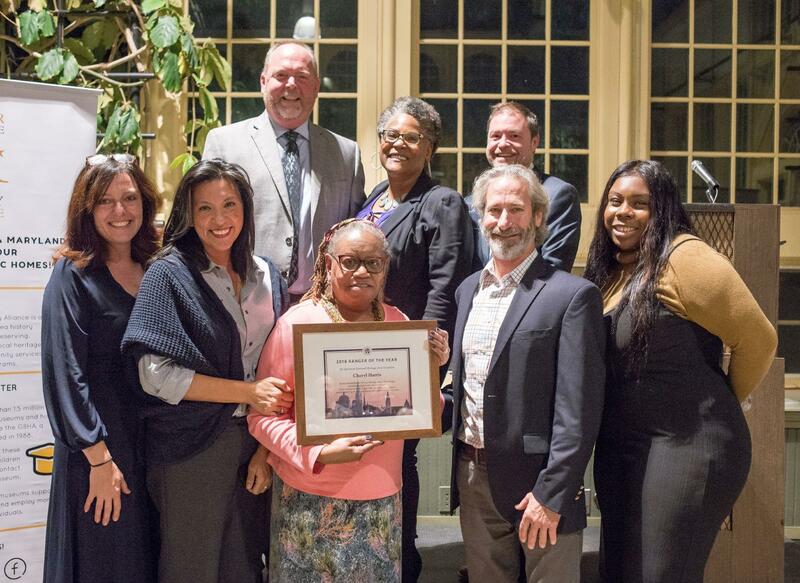 The Baltimore National Heritage Area (BNHA) recognized four partners of year at the organization’s annual meeting reception on November 9 at the Rawlings Conservatory in Druid Hill Park. 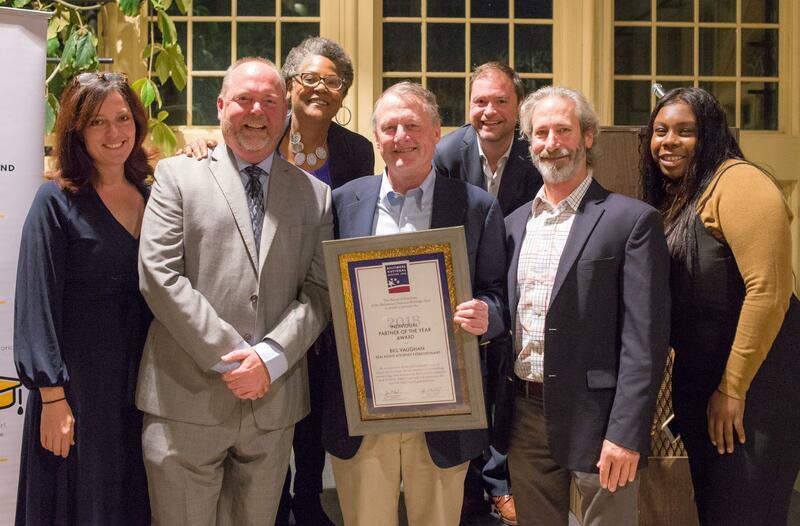 Each year BNHA awards the distinction to those who have helped the heritage area and its mission to promote, preserve, and enhance Baltimore’s historic and cultural legacy. 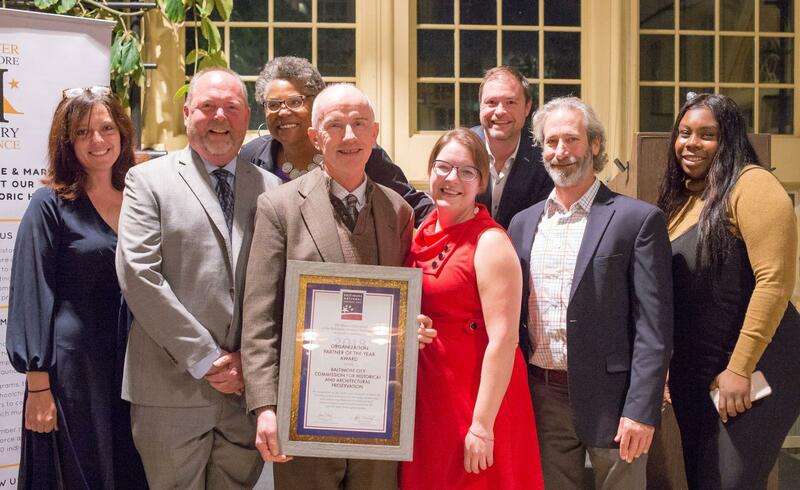 Bill Vaughan, a real estate attorney based in Annapolis, was recognized for his volunteer service on BNHA’s lease for the H. L. Mencken House. Vaughan provided hours of pro bono legal services and served as an incredible advocate as the heritage area navigated the agreement with the City of Baltimore. Bill Vaughan, center front, poses with BNHA staff and BNHA Chairman James Piper Bond. Over 20 years ago, the city’s commission led the effort to designate a heritage area within the boundaries of the city. Since then, CHAP has been a strong advocate and partner of BNHA. Preservation planners Lauren Schiszik and Walter Gallas accepted the award on behalf of the commission. 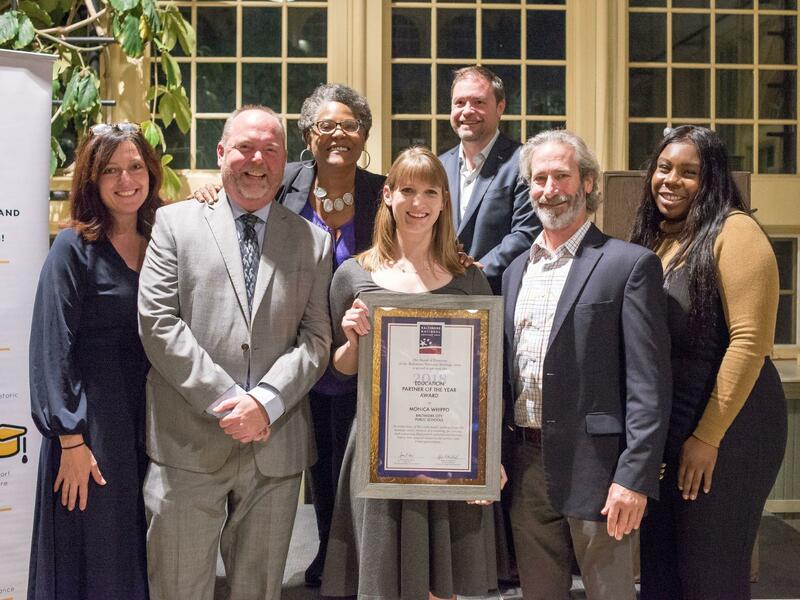 Preservation planners Walter Gallas and Lauren Schiszik (center front) accepted the award on behalf of the commission. BNHA honored two individuals who have not only been strong advocates of the heritage area, but have also been incredible partners of BNHA’s youth education programs. Kirsten Perry was instrumental in the design and implementation of the Kids in Kayaks program, which brings eighth-grade students of the Middle Branch to learn how kayak and about the ecology and history of the Patapsco River. Now with the Baltimore City Department of Recreation and Parks, Perry continues to ensure the program inspires city students to care for the local waterways. Monica Whippo with Baltimore City Public Schools was also honored. Whippo is a tireless advocate for the humanities and the city’s museums and historic sites. She has been key to many BNHA projects, including the 2016 and 2018 Fleet Week educational programs and a recent project researching Civil Rights Movement sites in the city. Kirsten Perry, center front, with BNHA staff and BNHA Chairman Bond. Monica Whippo, center front, with BNHA staff and BNHA Chairman Bond. The heritage area also named Cheryl Harris as the 2018 heritage area urban ranger of the year. Harris was honored for her devotion to sharing the city’s history to both visitors and residents. She is a familiar and welcoming face at the Poe House, where she has clocked nearly 400 hours keeping the house open. She is BNHA’s “go to” ranger for tours of the Pennsylvania Avenue Heritage Trail, which highlights significant sites of African American heritage in the Old West Baltimore historic district. 2018 Urban Ranger of the Year Cheryl Harris, center front, with BNHA staff, Poe Baltimore Director Enrica Jang, and BNHA Chairman Bond. 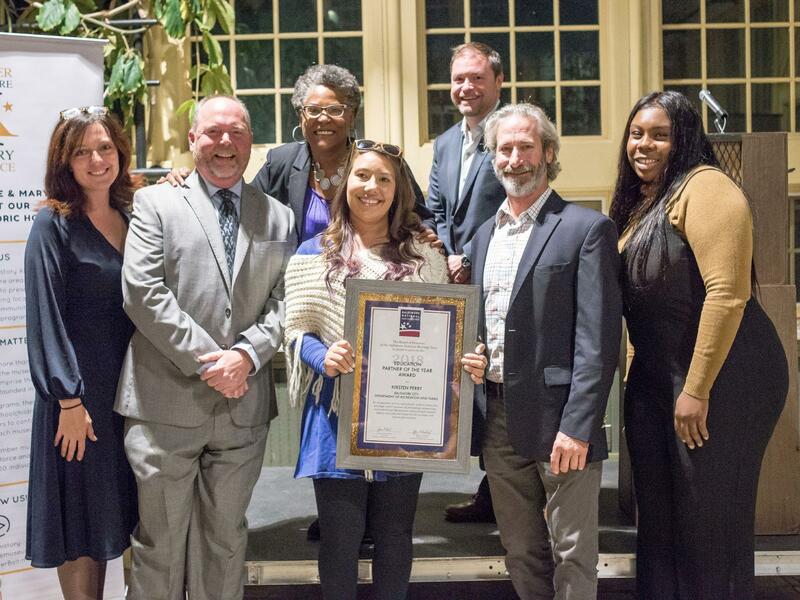 The Baltimore National Heritage Area thanks the Baltimore City Department of Recreation and Parks for hosting the 2018 Annual Meeting Reception and Awards and extends its gratitude to Mount Royal Printing and Atlantic Wine and Spirits for their support.